Most people stick to the Big Three Markets. See, statistics show that when it comes to forex; most traders focus on just three main currency pairs for most of their trades. The point is, they tend to ignore currency pairs they’re not used to. Perhaps they feel they don’t understand the market well enough. It’s a mistake because as I’ll show you, the ‘unusual’ market I want to talk about is just the same as any other market. It moves for the same reason: Demand and supply. People buy it and people sell it. That creates movement. And that movement creates a trading opportunity. Look, here’s the proof. 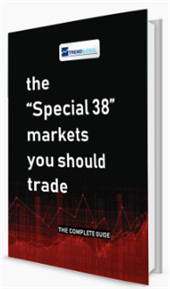 The special 38 markets you should Trade. Strategy for trading Stocks, Forex or Futures.